West Kelowna, BC, sits on the west side of Lake Okanagan, in British Columbia’s Okanagan Valley. 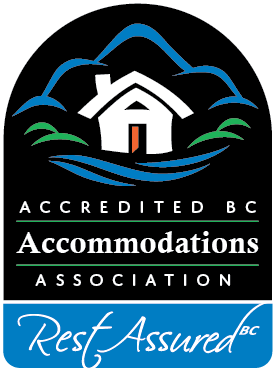 The dry sunny climate makes staying at West Kelowna Bed and Breakfasts lovely any time of year, whether your tastes run to golfing, skiing, hiking, boating, snowshoeing or enjoying a bottle of wine. West Kelowna is a four season outdoor playground. Enjoy the beautiful waterfront trail and beaches. Rent boats, kayaks, paddle boards and jet skis and enjoy the Okanagan Sunshine. Hike year round along mountain trails and enjoy the spectacular vistas of Rose Valley, Mt. Boucherie and Bear Creek Provincial Park. Sample the bounty of the Westside Farm Loop, including a summer farmers and crafters market, and in the fall, pick an assortment of nuts at the Gellatly Heritage Nut Farm. Golf at Two Eagles or Shannon Lake Golf Course and when you are done, enjoy delicious patio dining at either location. West Kelowna is home to the Westside Wine Trail where you can savor and enjoy many different winery experiences at over a dozen wineries, including Mission Hill and Quails Gate. Culinary delights, food and wine pairings, wine tastings and winery tours await you. Include a stop at a local brewery and cidery. As you travel around West Kelowna you will see the Okanagan language (nsyilxcen) and their culture woven into the community through signs, public art and symbols. The sqilxw people have lived in the Kelowna (ki?lawna?) and Westbank area from time immemorial. Experience their culture and art at their local museum or sample and experience First Nations food at the Red Fox Club at Indigenous World Winery. Whatever activity you enjoy, the West Kelowna area welcomes you to enjoy it here. Let go of the world at our adult spa inspired B&B located on the West Kelowna Wine Trail. Refresh yourself in our 30 ft. pool, relax in the hottub or rejuvinate in the infrared sauna. 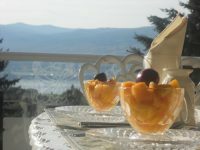 Enjoy a gourmet breakfast while admiring the panaromic lake, mountain and vineyard view. A West Kelowna upscale adults-only B&B experience, offering traditional Bed & Breakfast amenities plus facilities for guests to entertain themselves in the evening,including a movie theater, billiards, board games, fire place, hot tub and kitchenette-2 large Bedrooms with private bath,1 large suite. A View To Remember B&B is a stay to remember- Delicious,breakfasts-Outstanding B&B hospitality-Captivating views of lush vineyards, mountains & Okanagan Lake. 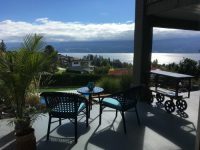 Located in West Kelowna, in the heart of The Westside Wine Trail, we are minutes to 10 Okanagan wineries incl. Mission Hill & Quails Gate.